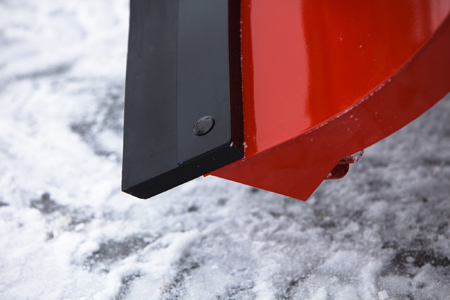 When purchasing a snow plow for the first or second time, the first thing that comes to mind when evaluating features likely isn’t the cutting edges. What comes to mind is probably a vision of a nasty blizzard and a long day of work and how much snow that snow plow will move when the big storm hits. However, the cutting edge on your blade and what it’s made out of really can make a difference on the performance of your plow and your snow removal business. Generally, there are two different materials used for snow plow cutting edges: Polyurethane and Steel. These options differ in how they help you get your job done per the requirements set by yourself and your customer. Urethane can expand your customer base. Many plowing contracts may specify that steel cutting edges cannot be used. If you limit yourself to only using steel edges you could lose out on potential business. The use of steel edges has the potential to wear down the sealant on driveways and damage landscaping. Because of this, property managers or individuals may require the use of a urethane cutting edge. Adding the urethane edge to your plow lineup can expand your customer base. Urethane is quiet. Apartment complexes, hospitals and those on your early morning routes will appreciate the urethane cutting edge as it offers a quieter alternative to its steel counterpart. A urethane edge also decreases vibration in the cab as the contact intensity with the ground surface is minimized. Urethane glides over frozen gravel. If you desire to keep a base layer of snow on a gravel surface, urethane cutting edges will slide over frozen gravel leaving a thin coating of snow on the surface. Urethane performs best with fresh snow or slush. The nature of the urethane material allows it to mold to the ground surface. Because of this, it creates a squeegee effect and performance is maximized when plowing fresh snow or slushy conditions. Urethane reduces obstacle impact. Urethane’s material composition is a type of durable, heavy duty, flexible plastic. In the event you hit a hidden obstacle the urethane acts like an extra cushion with the normal blade trip. That means less impact on you and your equipment. Steel is rigid. THE BOSS SNOWPLOW for example, offers an AISI 1080 grade steel or an abrasion resistant steel called Hardox® to make the steel cutting edge harder; and therefore, extending the wear-life of the cutting edge. A longer wear-life means you won’t need to replace the cutting edge as often. By choosing a cutting edge made of a high grade steel, you can save not only time and but also save on your pocketbook. Steel is visually appealing. Steel looks tough; plain and simple. For pickup trucks and medium duty trucks, the majority of plows are steel and the addition of a steel cutting edge completes the plow package. Steel performs best with hard-pack snow and ice. The rigidity of steel allows you to scrape away ice and hard-pack snow with nothing left behind. For anyone who often encounters these types of plowing conditions and prefers the plowed surface to be clean and clear, steel is definitely the way to go. When comparing the wear-life of either of these edge options, the amount of variables involved make this comparison anything but apples to apples. The wear-life will be dependent on the ground surface, snow conditions, hours of use, driver speed, etc. When shopping for a cutting edge, whether it is urethane or steel, make sure to compare the material grade used as this varies from one manufacturer to another. There is no doubt that both of these materials are tough and ready for the job. Polyurethane cutting edges are less damaging, quieter and may increase your ability to pick up accounts that require the use of this type of cutting edge. Steel cutting edges are more rigid, perform best in hard-pack snow and ice, and just look like a force to be reckoned with. Depending on your situation, you may choose to have both cutting edges available to you. The good news is that, with a little work, they edges can be swapped out to meet your needs.